The Azamara Quest has many lounge and bar venues to enjoy. 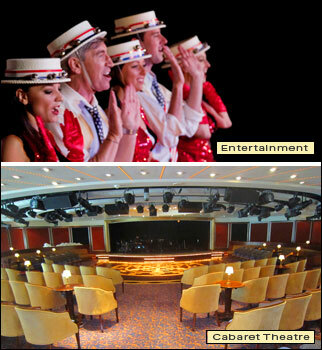 The Cabaret Lounge is the ship's show theatre. The stage is fronted by a small dance floor surrounded by plush audience chairs. A bar resides in the rear. Performances include Broadway musical numbers and cabaret singers backed by the ship's band. Comedians and magicians also take stage. Don't miss the weekly Jazz Brunch in the Discoveries Restaurant. A quartet plays soft jazz perfect for dining. It becomes quite busy when entertainers such as local folkloric dance groups perform for the poolside barbecue nights.